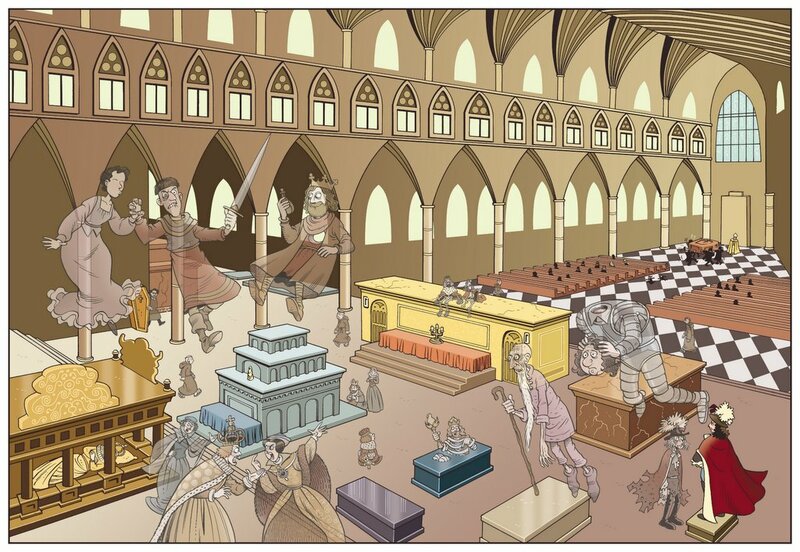 I had to draw Westminster Abbey for an issue of Horrible Histories a while back. The brief was to draw the inside of the cathedral in its full length, so you could see both ends at the same time, and to draw the ghosts of a whole lot of dead kings and queens and so forth walking around inside, big enough to be recognisable. Short of changing the laws of physics, this couldn't be done (unless you have a talent for recognising ants), so there was a bit of argy-bargy and this elegant compromise was reached. I'm quite pleased with the ghosts. Ladies and gentlemen, Mr Roger Langridge who can make a silk purse from a sow's ear. I keep picturing myself as if I had received the same brief, sitting perfectly still, reading it over and over and over, murmuring "but... but... but..." until the gentle weeping takes over. You've all been very kind, but until I have some sort of guarantee that I'm going to be buried there, it's all shallow and meaningless.